It can be hard deciding what to take back from China for yourself, or for others. 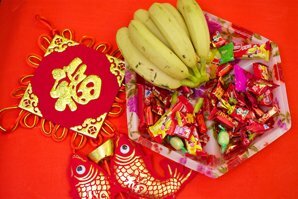 The best souvenirs are easily carried and full of Chinese characteristics, like 1) tea, 2) silk, 3) jewelry, 4) chopsticks, 5) cloisonné, 6) Chinese knots, 7) calligraphy, 8) wines and spirits, 9) masks, and 10) Mao memorabilia. Here we introduce the top 10 China souvenirs to take home for friends and family. Because tea plays such a big role in daily life (from tea brewed in people&apos;s flasks at their office desks to high-end tea ceremonies with special tea), tea quality varies throughout different shops too. If you want normal tea that people drink on a day to day basis, check convenience stores and supermarkets. 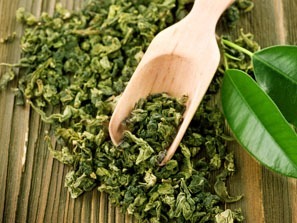 In many supermarkets it will even be possible to buy many different types of tea by the gram. 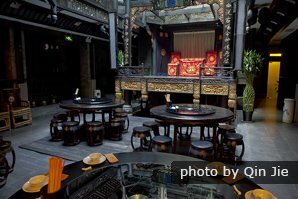 If you&apos;re in the bigger cities, check out the tea markets (Maliandao in Beijing, Tianshan Tea City in Shanghai, or Wukuaishi Tea Market in Chengdu) for special teas or for other tea-related products such as tea pots, cups, and the entire set needed to set up your own ceremony at home. Most shops will have a wide range of designs to fit any taste! Perhaps one of the most popular products to take home for female relatives, silk products are an old favorite. Nice silk clothing can be quite expensive, depending on the quality. The same goes for bedding sets, but smaller items such as pillow cases, bags, and accessories are more affordable and widely available at tourist sites. 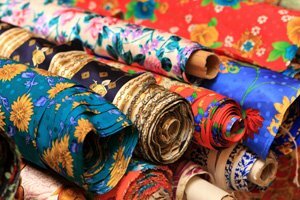 If you are interested in getting clothes or traditional Chinese clothes made using silk, our guides will be able to help you ensure the quality is good. Another favorite for the ladies is jewelry, of which there is a ton in China. Many stores will sell cheaper bracelets and necklaces, and areas near temples will often sell Tibetan-inspired jewelry (for example near Beijing&apos;s Lama Temple, other Tibetan temples, or at markets in Chengdu) which is made using silver and a combination of orange and blue stones. 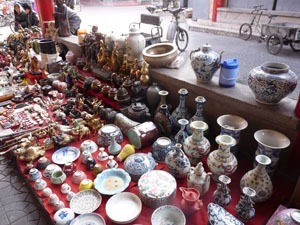 Sellers will often roam around areas popular with tourists too, so there are plenty of opportunities for purchases. Throughout the entire country you&apos;ll be able to find jade and pearl pieces too, but make sure you&apos;re buying from somewhere credible if you&apos;re wanting to buy an expensive and genuine item. Our guide can help with this. Otherwise there is a lot of lower quality jewelry available for very little money. If you&apos;re planning on taking your new chopstick skills home, you&apos;ll have to get some chopsticks here. Chopsticks are really easy to find, as stores throughout the country sell beautiful boxes of chopsticks whether you&apos;re looking to buy just the one pair, or ten identical pairs. Sometimes you&apos;ll also be able to find chopsticks that are attached together as the top in case you&apos;re not that confident in your chopstick skills yet. You can also get matching bowls and chopstick holders in many stores, which makes for a great present to add some Chinese flair to anybody&apos;s kitchen. 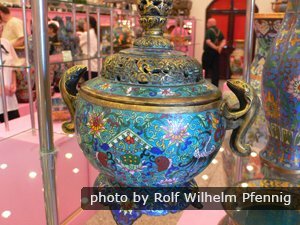 Cloisonne products were introduced into China a long time ago, and are very popular throughout the country. You&apos;ll find vases, beads, jewelry (especially bracelets), plates, and other trinkets readily available throughout your travels. Not all of it is of the same quality, and this is important to keep in mind when you are bargaining. As with many things, if you&apos;d like to get an expensive and high-quality piece, please let our tour guides know so that we can arrange for you to visit a nice store. The Chinese art of knotting is an ancient art that produces beautiful pieces. Whether you&apos;re looking for something small like a key chain or a bigger piece to hang up in your house, they come in all shapes and sizes. They are usually red, but there are always varieties. You&apos;ll be able to find these at all tourist attractions&apos; stores or be able to buy them from vendors along the side of the road. These little gifts are perfect if you&apos;re buying for a large group of friends, too. Let us know if you want to learn more about them, as our guides will be able to explain the significance to you, and show you how they are made. 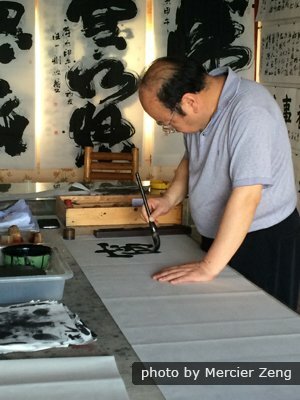 Chinese calligraphy is an art that is famous throughout the world, and pieces of intricately made art can be bought to hang up on your wall, no matter what size. Calligraphy is also available on fans, pottery, or on cloth. There are many different styles (seal script, cursive script, running script, official script and formal script being some of the main ones), and you can even get your own Chinese name (ask your guide what your name would be in Chinese!) painted to take home as a souvenir. For the really manly men out there, or those with a strong stomach, Chinese spirits and wines may be the best gifts. Although the Chinese wine industry is still developing, there are some pretty good wines to come out of northwestern China (Xinjiang province mainly where grapes are abundant and which also holds an annual Grape Festival late summer/early autumn). In terms of local spirits, baijiu, made out of rice, is the local poison. You can get this by the side of the road at a convenience store (about 5 yuan for a little bottle), or in a really high end store (thousands of yuan per bottle). In the end, it mostly tastes the same and doesn&apos;t leave you feeling great the next morning (unfortunately speaking from experience). However, baijiu is a huge part of Chinese culture and Chinese business culture and bringing a bottle home is nice for those passionate about alcohol. Look out for Moutai, one of the best brands. 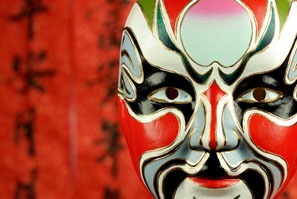 The opera is a huge part of Chinese entertainment, and the masks are an important part of the overall show, especially in Beijing Opera. To take some of the show home with you, or if you think the masks would be a great addition to that blank wall, check out the souvenir stores. They&apos;re available in many different sizes and in a range of different color combinations depending on what you prefer. Mao memorabilia is a huge trade in China, and you&apos;ll find items such as the little red book, watches, propaganda posters (real ones and copies of them), school books from the Mao era, and more. Although most items can be found everywhere, if you want the nice items there are a bunch of specialty stores in Beijing&apos;s Panjiayuan market, and you can find real items at the Shanghai Propaganda Poster Art Center, which is coincidentally a great way to spend an afternoon or morning in Shanghai. You’ve bought loads of souvenirs... now, how to tie it all together when you get it home. We have all had that Spanish donkey moment when you bring home your souvenir and realize it just doesn’t fit in your house. What looked like a good idea in the sunshine, doesn’t look so good now. Maybe you need a whole room redecorating to accommodate it all. This is definitely the easiest way to do it — a Chinese room. So, which room? Lounges, dining rooms, or bedrooms probably lend themselves best to this theme. For a wall covering, try to select something with a Chinese theme, or that picks up one of the colors in the material you have bought, e.g. bamboo wallpaper, or lotus flowers. Using Chinese silk, you could make a a zig-zag screen, like in the movies. It’s also a fengshui remedy as it blocks off feet pointing towards the door. Make a framework and stretch the silk over the pieces, stapling it to the sides. You could also make cushion covers with the spare silk. Featuring the Great Wall (or another long scroll painting) on your longest wall works well. Large Terracotta Warrior replicas go well as door guards. 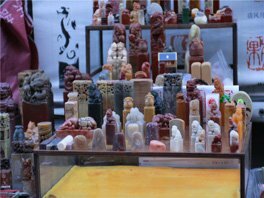 Dedicate a shelf to displaying smaller items: panda souvenirs, jade and marble trinkets, Zen gardens, painted snuff bottles, musical stress balls, lucky Chinese coins, yin-yang candle holders, etc. Although the majority of these items are available widely throughout the whole country, please do let us know via this form if there&apos;s something specific you have in mind. This way, we can tailor your tour to your needs and make sure you take home the best souvenirs to remember your incredible time in China! If you&apos;re stuck buying gifts for children while in China, check out our article about buying souvenirs for kids. There&apos;s something for everybody. We&apos;ve also listed out specifically what to buy for him and for her in China, in case you&apos;re at a loss. 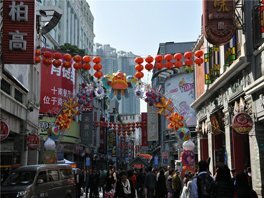 Read this article for an overview on shopping in China and what to expect, and for links to specific shopping pages for different cities throughout the country.